PC Commander gives you total control over anything running on your Windows PC, all conveniently from your web browser. 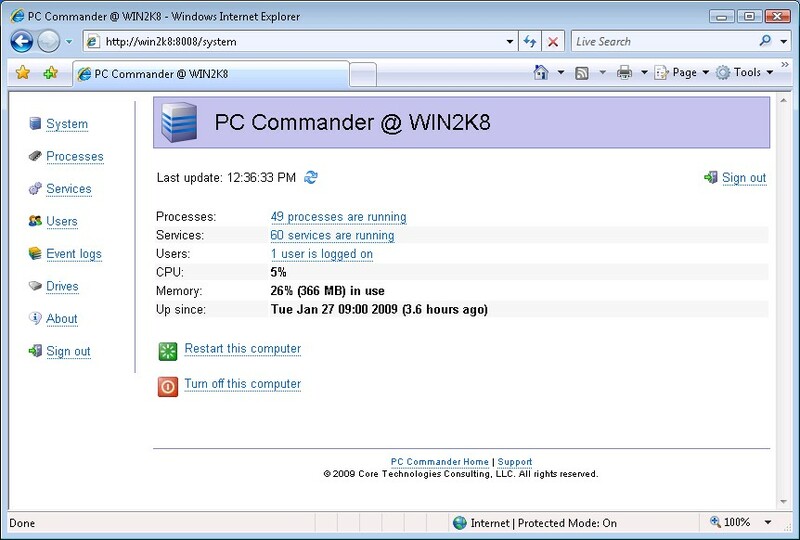 With PC Commander, you can easily (1) View all running processes and safely stop any you choose; (2) Control all services, starting, stopping, pausing or resuming any at will; (3) Disconnect or log off any user logged on to your PC; (4) Browse your PC's drives and download any file you choose; (5) View important information in the Event Logs; (6) Restart your computer, monitor overall CPU and memory usage, and perform many other Windows Task Manager activities. Furthermore, PC Commander is fully standalone and is very easy to install and administer. It does not require IIS, Apache, PHP, MySQL, J2EE, or any other web components to do its job. Take advantage of our free 30-day trial and experience it for yourself!